Rock the old school look with this iconic pair of Ray-Ban men's original Wayfarer sunglasses to reflect your confidence and zest for life. With its distinctive Wayfarer style, a refreshing green lens tint and the quintessential signature logo to stamp its superior quality, this pair invites compliments wherever you go. The classic black frame flatters a wide range of face sizes and shapes. This pair of sunglasses promises the exceptional optical quality of a glass lens in a lightweight plastic frame that lasts. Treated to block harmful UV radiation, these sunglasses keep you safe in the sun. A classic! I've worn this style of Ray Bans for as long as I can remember! Wayfarers are iconic! A look that never goes out of style! Just a little bigger than expected. I bought these for my 17 year old son. He likes the style and shading of the lenses, but the frame size is a little bigger than we expected. Nice quality item, though. The sunglasses arrived quickly & were authentic. Not a knock off or a defective pair. Beautiful! Bought these for my 6'5" son, thinking these were a standard size. They may be, but looked ridiculously small on him. Will return for another version. Otherwise, glasses are exactly what you would expect as the classis Wayfarer. Great, high quality glasses with a timeless look! Classic glasses. I bought them on overstock because I had a coupon, so they came cheaper than elsewhere. They are a bit heavy, but it’s just they’re style ! I purchased these sunglasses to give them as a gift. Upon receiving them and examining them the frames seemed to be previously used. They had multiple small scratch marks and the "authentication" sticker was half peeled off. The chrome accents also looked dull and old. Overall I was very disappointed with this purchase. I will be returning them. Maybe if they were for my self I would have kept them because of the price savings, but seeing how they were to be a gift I dont feel comfortable giving them away in this condition. Great fit!! And shipping was fast. "Will it come with a case?" "I am skeptical of the authenticity of these glasses as the country of origin is from China... Does overstock guarantee that these are authentic Ray-Ban?" Overstock.com stands behind every product we sell. When necessary we can contact suppliers if a product issue arises. Thank you for shopping with us. "Hi, what is the difference between the Men's version of these sunglasses vs. the Unisex version (why is unisex cheaper)?" Hello kt7876, The unisex sunglasses have Crystal green G-15 lenses while the men's item have glass lenses. The unisex item also has a slightly larger dimension than the men's item. The difference in materials will most likely contribute to the difference in cost. Thank you and happy shopping! "Are These The Originals Number 2's"
Hi frankalvarez14, we were able to verify this information with our support team. 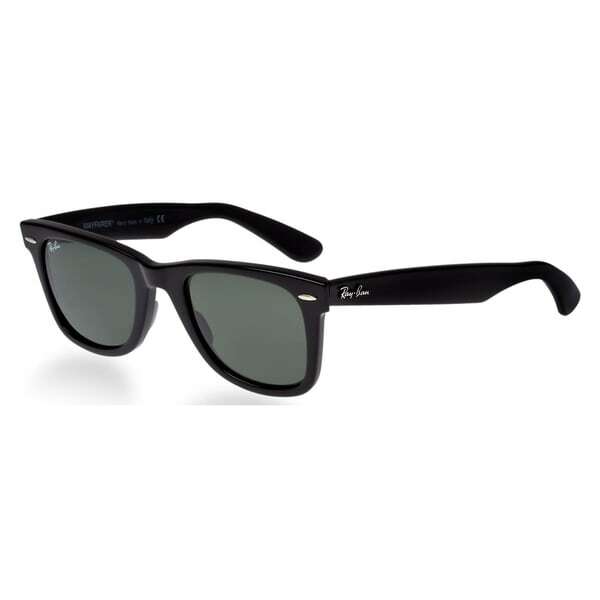 They are original Ray-Bans, unfortunately, these are not classified as original number two's. This is the original wayfarer. We hope this helps. Thanks for shopping with us. Hello, moneyballing, these sunglasses are not polarized. Thank you for shopping with us! "are these original from ray-ban?" Hello alejmm12, this product is manufactured by Ray-Ban. We hope this information is helpful. Thank you for shopping with us and have a wonderful day!